The Engine 67 firehouse designed by Ernest Flagg & Walter B. Chambers c. 1898 at 518 West 170th Street in New York City. 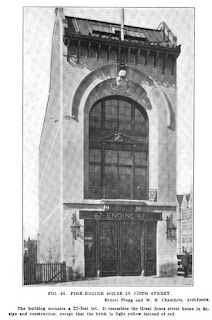 The pair also designed the Engine 33 firehouse at 44 Great Jones Street seen HERE the same year. Click HERE to see the Engine 67 firehouse on google street view. Photo from Architectural Record, 1901. Sorry to see the doors and pair of flanking lanterns gone, but glad to see the exterior otherwise seeming to be intact. As I don't think I have ever been on W 170th Street, this was a treat.